Worldwide demand for gears will grow 6.0 percent per annum through 2019 to $221 billion. Gear demand will expand the fastest in China and other industrializing nations, where the production of motor vehicles, motorcycles, and other durable goods will be the strongest. More use of higher tech gears will boost value gains. 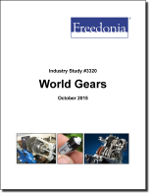 This study analyzes the $165 billion world gear industry. It presents historical demand data (2004, 2009 and 2014) and forecasts (2019 and 2024) by product (e.g., gear assemblies, vehicular gears, individual gears) and market (e.g., motor vehicles, machinery) for six world regions and 19 major countries. The study also considers market environment factors, details industry structure, evaluates company market share, and profiles 35 industry participants, including General Motors, Volkswagen, and ZF Friedrichshafen.